Congratulations Ireland - well deserved win and you deserve to win the championship. Massively frustrating from Scotland - 4 good chances we completely butchered and we just didn't execute well all game. And that is the most frustrating thing. Scotland are truly getting into try scoring positions and leading the line well but the composure is not there away from home. The scoreline flattered Ireland I feel as Scotland matched them in every other aspect. Composure would have been better for Scotland if at home. Well played Ireland, did exactly what you needed to and got the bonus point, clinical and a very very hard team to beat. Very much pressure onto England now, and here's hoping you can do the business at Twickers too! Yeah our execution let us down a bit, but the way Ireland starved us of possession was outstanding and frustrating in equal measure. Ireland were well worth that 20 point win. Ireland fans your craic as always has been a pleasure and your team were very solid today. Ringrose was not even remotely lacking of test match fitness and a big shout out to Toner who just ruined our line out from start to finish. All the best at Twickenham next week guys. Good game, Scotland unlucky just picked the wrong choice or poor execution. Scotland scrum has been the biggest over achievers of the 6 Nations. Held their own against every team. Edinburgh's improvements really helping Scotland's depth. From a Scotland perspective it's good to see how well kinghorn played - he looked perfectly comfortable at this level. It was a very strange first 10-15mins for him as it looked like Earls was more in the midfield and Ringrose out wide but after that he was superb. Completely shut out the very dangerous Jones and showed some excellent awareness and great running lines. Kearney was deserved MOTM but Ringrose really pushed him for that. Very nervous clinging on first half. That was a very important half. The idea was to suppress and suppress Scotland's best efforts and boy did it take work. Sorry billy. Only messing. Wonderful game by the old eagle eyed devil. Don't know what to say in detail yet. But Christ.... that was good to get the win. Right. Hard luck Scotland, we got yiz this year. Look forward to the return match. Time for a few beers. I truely thought Ireland would lose today such is the high regard I have for this Scotland side. Thankfully I got that one wrong. Great game and at long last one that didn't murder my nerves. Never worry Scottish 606ers, you have sweet memories of that English game to savour for a long time to come. 2019 will be our year. Kinghorn is looking great, we have a couple of livewires coming through and I think finn will come of age in France. Our time will come. I feel more optimistic now than I have for a long time. Pretty sure scotland can overtake ireland in the next 12-24 months. SecretFly wrote: Very nervous clinging on first half. That was a very important half. The idea was to suppress and suppress Scotland's best efforts and boy did it take work. The pack did fine but lineouts were rotten. McInally didn't have a good game. Too many penalties conceded. We didn't adapt to Barnes. He wasn't interested in carriers not letting go of the ball. He was only watching for the defending team infringing. Brendan wrote: Good game, Scotland unlucky just picked the wrong choice or poor execution. I have been one of Kearney's biggest critics the last couple of years but during the AI's and now the 6N, he has been brilliant. Will take a lot to oust him now. alive555 wrote: Congratulations ireland. Well played. Could be. But hell, all us Irish fans think we have to get a lot better than we're playing through this 6N. There certainly is room to do so. The bonus is there are players now creeping in bit by bit that have the tools to mature and steady this team. I think that's a bit of a harsh assessment tbh tattie. Our team is still very green for the most part in terms of combinations. We will get the away wins soon, but today we were beaten by a very clinical Irish side who played the percentages. Yes the butchered opportunities were hugely frustrating, but they weren't easy opportunities, however they looked. We're hardly back in the doldrums. I feel like even if some had come off we'd still have lost to a very street smart side. Still far better away performance than we've seem recently. And for those that think I'm being arrogantly confident here before we even win anything in the 6N. Nope, I'm only messing. The Oracle wrote: Put down the knitting needles Eirebilly and SecretFly, those grand slam onesies you’re making will have to go on hold! OK, you can get them back out now! Scotland - pretty good at home, quite poor way from home. Congrats on the tournament win Ireland Very well played. Now go and get the grand slam next week! If it wasnt already blatantly obvious Joe Schmidt is easily our greatest ever coach. Im sure it wont shut up the doubters though. 3 championships from 5 is an incredible record. ...but but but he has never won a slam. Lol. 3 from 5. Irelands victory and Englands defeat also means that Ireland will replace England as world number 2 come Monday. Also huge pops for that Connor Murray try. Some power to get over the line. I also loved the setup for Scotland's try. Nice move. Aye congrats. Very happy for Ireland really. They have been the best team. Maybe today was the worst result (England) that could have happened though, as England will be manically agressive at home and now even more so maybe. That said no pressure on Ireland now the championship is wrapped up, as great as a clean sweep would be. Grand Slam beckons, but is that going to be a game to far..
mikey_dragon wrote: Scotland - pretty good at home, quite poor way from home. I think what you say is true though, but considering we were getting battered at home and away as recently as 2 years ago, holding all our home games for the last 2 years is a good foundation. As others have said I think we can build further under townsend and we'll be peaking next year for the RWC. Congratulations to our Irish brethren. We'll deserved champs and England look really vulnerable. I know that, and we definitely haven't lost to Italy away from home either. I don't think Wales' away form is as bad but that's not the point; We were discussing Scotland. Scotland have had some big recent wins at home and have got 'battered' away from home twice. I'm sure the away form will come, Toonie needs more time but Scotland are certainly going in the right direction. I agree that Scotland will be a lot better for the RWC if the progress under Toonie continues. I said before the tournament that Ireland were the most settled team. Recent injuries to the Irish team did put some doubt in my mind but the guys coming in stepped up. Congratulations to Ireland, pretty happy for them for getting the tournament win, not as happy as Glen Jackson is right now obvs. I expect Ireland to go on and get the Grand Slam. I would like to congratulate Ireland for winning the 6ns a week early. 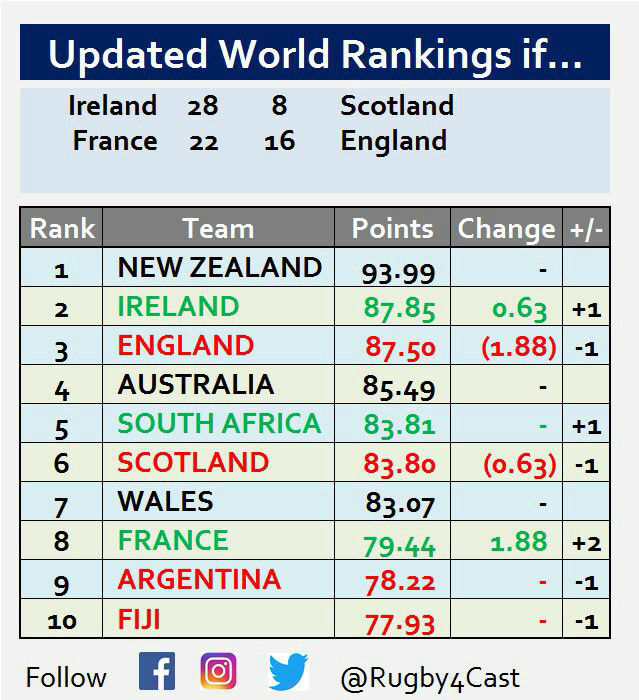 Still the Grand Slam to play for next week, but it is looking very possible that Ireland will win and win well, unless England get there act together and spoil it for Ireland. But like i said well done to Ireland. TightHEAD wrote: The sweaty socks couldn't get up for this game then! How did England get on today? Great game, and I agree the score did flatter Ireland a bit, the best team obviously won though. Irelands defence out wide isn't great and for a couple or three better passes Scotland could have taken advantage, but that's the way it goes at this level, you have to take your chances. Hmmmmmm. I prefer Ireland’s brand thanks. Didn't watch the game but well done to my paddy brethren - I never mind when Ireland wins the whole hoopla. It's the next best thing to us winning it. So if there is one word to sum up Scotland's failings yesterday it is execution. And not just with the botched tries - although there were 3 glaring examples, 2 of which were open goals - but throughout our game. Missed kick to touch, lineout falling apart, poor decisions with the ball and also in giving away penalties. The lineout was particularly disappointing as it just looked like the drill was completely off. That shouldn't happen at international level - what they been doing at training all week?? The botched lineout before half time was particularly criminal as it changed an attacking opportunity to losing a try - that was the game. Horne's interception was hugely disappointing but even if Stockdale hadn't rushed out the line it looked like Horne's pass was going to no one anyway as he wasn't on the same wavelength as those outside him. There were also little things I noticed - not committing the defence before passing, throwing missed passes with overlaps where they needed to draw the defence and create the extra man. So we executed badly across the pitch, and if there's one thing our game plan needs it is execution! RDW_Scotland wrote: So if there is one word to sum up Scotland's failings yesterday it is execution. And not just with the botched tries - although there were 3 glaring examples, 2 of which were open goals - but throughout our game. Missed kick to touch, lineout falling apart, poor decisions with the ball and also in giving away penalties. Yeah execution felt a bit off, however it still felt we played well and Ireland deserve a lot of credit. Toner really attacked our line out and Sexton's positioning to pile the pressure onto Jones was an example of real experience. As others have said I think this is a year too early for us, but had I been offered 3 wins out of 3 which looks likely at the start of the tournament I would have considered it a success. Ireland are a very very good side and by some distance the best in the tournament. Losing to them despite butchering 2 clear try scoring opportunities is encouraging. As the players get used to each other and the style more of those will start sticking and we'll be really in with a chance of winning the tournament. I firmly believe this team will win it over the next few years. Wilson went off too early to rate and i think we missed the balance he gives. We got to see what Denton can do over most of a game and I wasn't massively impressed. He is big and physical but really doesn't have much of a rugby brain! Tried his best but failed to exert control over the game. Strangely, thinking back I can't actually remember his involvement in the game which perhaps says it all! Maybe Townsend took too much responsibility away from him? A good all rounder but he really looks to have lost his pace. A real positive from yesterday - looked dangerous in attack and didn't make any mistakes. Delighted that he got a try and it was well taken. Another guilty party in the butchering front, and struggled to make any real impact. He's had a quiet tournament and will be a frustrated man. Scottish fans, is Laidlaw a help or a hindrance? He is great for kicking goals but he is not the most dynamic or attacking 9 for the style you wish to play. Agree generally with the comments. 2 open goals and a pretty simple 3rd was the difference today. We did not execute the simple stuff. Ireland were the better team in the second half and, whilst I do wonder what would have happened had it been 10-0 (not giving an easy intercept and hitting our lineout before the second try), Ireland executed better than us. The World Cup will be fascinating to see who can win on neutral ground. As for Laidlaw, he played well and rapidly against France. Against England he slowed a bit but it worked well in the end. He looked slow against Ireland and should have tried mounting the tackler, like Murray was doing, more often. Maybe he has been worn down by playing full games for Clermont between international weekends. Scotland; well with 38% possession we created enough openings to win the match. As the old saying goes, "Some days you eat the bear and some days the bear eats you." I think it's interesting that we blew a couple of chances, and gifted Stockdale's try, by trying to throw miss passes that weren't on. Had the coaches identified that Ireland defend narrow and drummed it into the players to give it air at EVERY opportunity? "Play safe, play the percentages. Isn't that what you always told me? Well I got news for you: percentage players die broke too. Lets shoot some pool fat man." Joe Schmidt's philosophy of rugby came out on top yesterday. But, if Scotland had been just a bit luckier or cuter or calmer then it could have been very different. 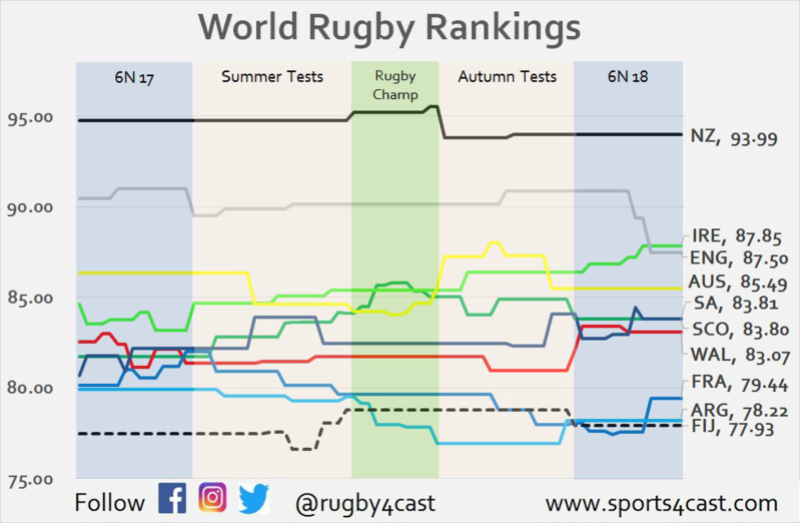 Toonie's teams will always be a rollercoaster and after years of decrying Gatlandball it ill behoves us to complain about the peaks and troughs. We may not win a Grand Slam next year, or a World Cup but it'll be exciting to watch. Remember: percentage players die broke too. Okay, so here's my ten cents worth on Scotland - a very broad/undetailed overview of where they are. It's not a criticism but just my concept of what they need now to more fully sculpt the way forward. Billy has mentioned Laidlaw and questioned his 'attacking' credentials. Fair enough. But that would be my main contention, it seems the only solution to everything from a Scotland perspective seems to be attack, how to enhance it, how to get the best players in to effect it, how to hone it and make it more accurate etc etc. I personally don't think Scotland need more attack though. I think they need a lot more pragmatism and now need to concentrate more on the boring stuff, the plod stuff, the incremental set-piece stuff, the 'Irish' stuff if you will. Indeed, I'll go the whole hog here (pardon the pun) but Townsend now needs to do the balancing act of keeping his sharp attack sensibility going but to slow the game way down in other parts and become a more wholesome side - a side that has the patience to wait more and use the fleet foot stuff more as an ambush than what it is now, which is a relentless drive to panic an opponent out of the game. Ireland played a very wise game yesterday. Joe Schmidt really is a ruthlessly efficient, thinking coach and probably this more than any season before, with genuine young players coming in to solidify his gameplans, shows him at his best. When we were under the cosh in the second quarter, when it was certain that Scotland were in their 'kill off' mood and trying to panic us out of the game - that's when I felt the Irish concentrated most and were more than ready for a HEAVY DUTY stint of furious defending. But the smart thing was that I was thinking at the time, and sensing it off our players, that they knew the Scottish madcap phase would end. They were working oh-so-hard but still calm in temperament. They trusted their strategy. They were waiting for the Scottish searing attack period to end. They knew it would end. You can't trick a well coached side, and a side with quite a bit of experience in it, to expect the onslaught to last forever in an 80 minute game. Scotland likes to try to trick sides into thinking this is going to last all day, 'you're not going to hold out, just capitulate and make life easy for yourselves. Raise the white flag. You're done'. That's the momentum Scotland have in those purple periods - that's the message they are trying to sell. And I think some side have understandably panicked under that pressure. They are a very fit side and their fitness routines are obviously based heavily around ball-in-play, loose-running-and-passing space finding. But even that brand of fitness doesn't last forever. Even they need a breather. But they don't seem to yet have a game that can get them through their own 'breather' patches Because their whole psyche is driven by the chaos moments, they suffer when the boring/slowing down containment periods are needed. Townsend needs to look at one stat when he measures up his gameplan; 7 tries for - 11 tries against. So far only Italy have a higher 'against' tally in this competition. You might say it's still only 3 tries more than Ireland let in but that's an Ireland side that have a pointed gap in their own game plan, pointed out by coaches from other sides through this contest, that makes them very vulnerable in the wide channels. Ireland have a noted weakness. Scotland haven't noted theirs yet but it's let 11 tries in anyway. More attack won't solve it. It's the boring stuff that will but does Townsend have the will and patience to think about the boring stuff? I think you are being a bit harsh on your players for missed chances. Ireland was putting them under fierce pressure defensively. It will probably take a year or two to develop that composure to play away from home and win. Always a good start to win all your home games. Hogg's miss maybe but the Jones and Horne ones were individual errors - Ireland were all at sea with those breaks and we messed up basic 2 on 1s.